I made this a while ago and since I have nothing new to post this weekend, this was the best thing I came up with. The bead stick is made out of metal clay. The picture shows the front and back of the stick. The silver beads are made out of metal clay too. 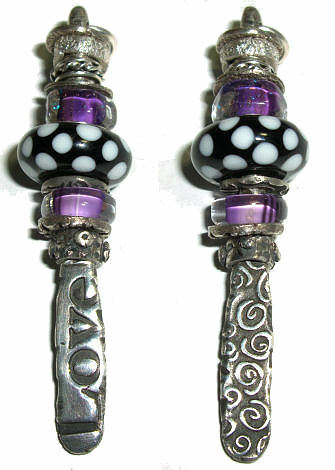 The purple beads are furnace glass from Mingo and Asho. These glass beads are awesome!! I made the black and white dot bead.